Con Noi is the perfect mix of secure, low maintenance, care free living. There are many opportunities to stay active and healthy, socialise with other residents and entertain family and friends. Keeping your body healthy and your mind active is easy at Con Noi. Enjoy nature and the beautiful green spaces surrounding Con Noi. 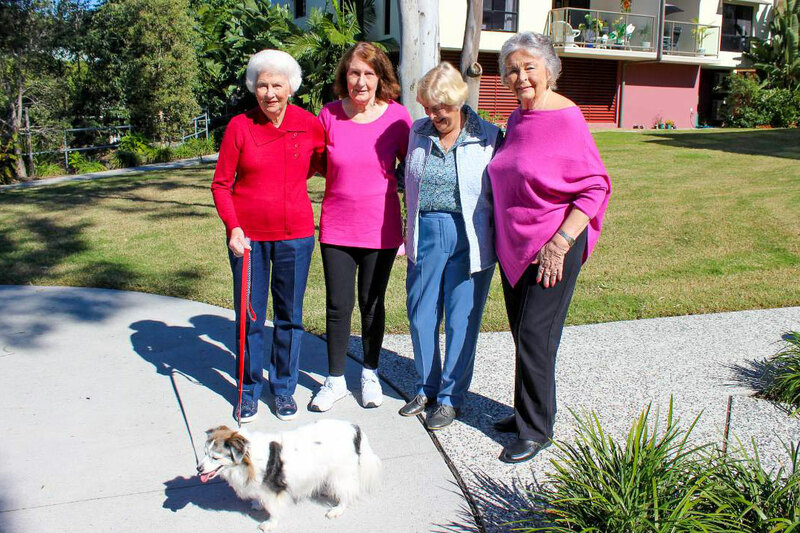 Our walking group explores the paths along Bulimba Creek and neighbouring parklands. It is important for ongoing walking stability and independence to maintain core body strength. The benefits of mild exercise to cardiac health, weight and sleep are well known to enhance health and well being. Join our weekly exercise group where balance, weights, steps and stretches are featured in a program designed by an exercise consultant. Looking for something a little more strenuous, then our state-of-the-art in-house gymnasium, specially designed for ease of use by seniors is what you are looking for. Why not have our consulting physiotherapist design a program and instruct you on safe use of the equipment? Enjoy a few quiet laps first thing in the morning or join in the weekly Aqua Aerobics class – our heated Saltwater Pool is always popular with residents. You can relax and enjoy a swim with the grandchildren when they visit. 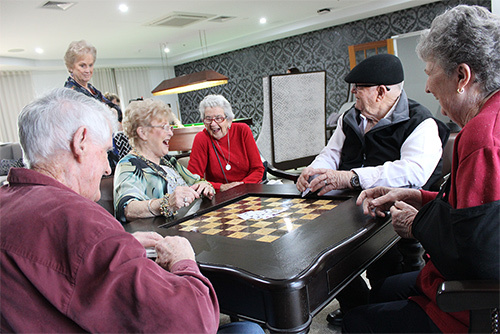 Socialising with others, sharing hobbies and having a laugh keeps the mind active and engaged. Twice a week our residents test their skills in a friendly competition of indoor bowls. Our spacious grass areas are ideal for playing bocce. Meet on the grass for some lively competition and a fun atmosphere. We have a group of “passionate gardeners” who have taken a special interest in the Con Noi gardens. Residents have the opportunity to have small plants within their apartments. A bonus is that fellow residents are willing to look after your greenery when you go on holidays. Are you an “Eddy Charlton”? Whether you prefer pool, snooker or billiards, you’ll find plenty of like minded residents who are ready to avoid the “in-off”. You are welcome to join the Mahjong players in their weekly games at both Con Noi and within the surrounding community. As C.S. Lewis once said “You can never get a cup of tea large enough or a book long enough to suit me.” Our resident book club welcomes you to take your “cuppa” and share your latest read with others. Share your views, recommendations, criticisms or just friendly banter over your favourite book. Expert or beginner, all are welcome at the regular cards sessions. 500, Crib, Rummy – you name it, we play it. Building new friendships is part of Con Noi’s community life. ‘The Circle’ meets in the bar every week for drinks and a chat. 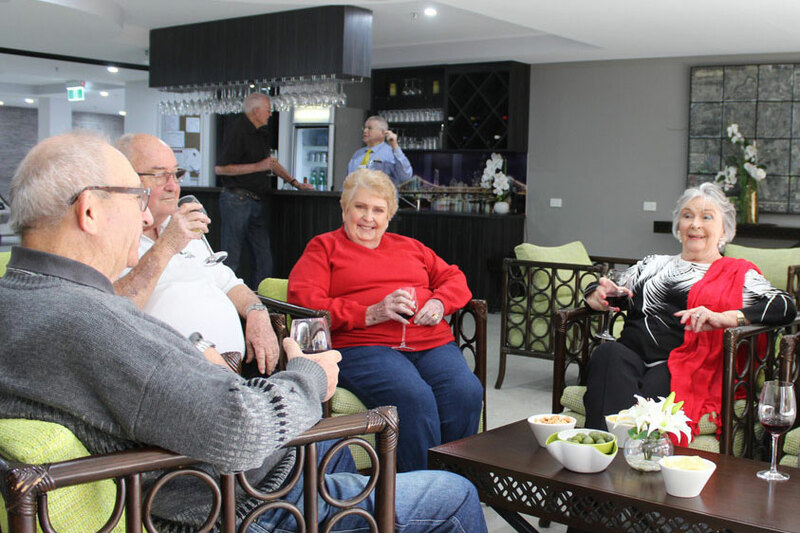 You can join us on Fridays for Happy Hours, sing-alongs and invited entertainers as arranged. Cibare is Con Noi’s coffee shop. We serve delicious cakes and drinks in a casual setting. Cibare is open on regular mornings for you to enjoy. Con Noi’s Social Committee actively promotes the various activities and events on offer. If you enjoy your own company, or maybe the quiet company of others, Con Noi provides areas and facilities to maximise your enjoyment. Our user-friendly computers are connected to the internet and provides a gateway to the latest news, to stay in touch with loved ones and to research online. Head to the library where you can use our computers and connect to the internet. Biographies, murder mysteries, reference books, travel books, and thrillers, you’ll find them all in our well-stocked library. Puzzles, DVDs, CDs and board games are available in the library for your enjoyment. Join the quiet company of others and enjoy a movie on the big screen with a surround sound system. Our specialist consultation room provides privacy for you and your visiting doctor, podiatrist, acupuncturist or massage therapist. Pamper time! The hairdresser visits regularly by appointment, providing services as requested.